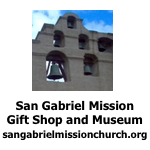 San Gabriel, Calif.–San Gabriel Mission will celebrate its 239th birthday on Sept. 3-5, with many festivities at its annual fiesta that is always held Friday through Sunday of Labor Day weekend. The fiesta will be open on Sept. 3, from 6 p.m. to midnight, Saturday, Sept. 4, from 3 p.m. to midnight, and Sun., Sept. 5, from 2 p.m. to midnight. On Friday, Sept. 3, the Ringing of the Bells Ceremony will start the fiesta at 6 p.m. at the mission bell wall, followed by the Blessing of the Fiesta Grounds. Saturday, Sept. 4, festivities start early at the Fiesta Stage with the Children’s and Pet’s Costume Contest at 9 a.m., followed by Blessing of the Animals at 11 a.m. Gabrieleno-Tongva Indians and re-enactors of history are invited to be in the mission gardens from 1 p.m. to 4 p.m. Re-enactors invited are Fr. Junipero Serra, Klaus “Adobe Man” Duebbert, a blacksmith, wool spinner, soldiers, and other re-enactors. That will be followed by the History Reception at 4 p.m. in the mission museum patio that will include honoring a person or persons whom have volunteered to improve the mission buildings, grounds, give guided tours or help in the local historical community. The Birthday Cake Celebration is scheduled for the Fiesta Stage at 5 p.m. Happy Birthday will be sung for the mission and for anyone with a birthday close to the fiesta. Free birthday cake will be given to fiesta attendees while cake is available. On Sunday, Sept. 5, the Founders’ Memorial Mass at 9:30 a.m. will be in the old mission church. Gabrieleno-Tongva Indians and re-enactors of history have been invited to be in the gardens from 1 p.m. to 4 p.m. Among the traditions of the fiesta are the Royal Court Contest and the Fiesta Royal Court members representing the mission at its fiesta and throughout the year at church, civic and social events. Julia Hernandez of Alhambra High School is queen, and princesses are Michelle Nguyen of San Gabriel Mission High School and Briana Hernandez of Gabrielino High School. After a Volunteer’s Mass on Sat., Aug. 21, at 5:30 p.m. in mission’s Chapel of Annunciation, the Royal Court will be crowned in the mission parish center at the Coronation and Banquet, and that event is free. game booths, international foods, entertainment in the evenings, and prize drawings totaling more than $10,000 on Sept. 5, at 11:30 p.m. during closing ceremonies on the fiesta stage. Also, bingo in the air conditioned parish center will be played on Friday, Sept. 3, from 6:30 p.m. to 10:30 p.m., on Saturday, Sept. 4 from 1:30 p.m. to 10:30 p.m., and Sunday, Sept. 5 from 1:30 p.m. to 10:30 p.m. Those hours may be subject to change. The mission museum and gardens will be open for free on Sept. 3-5, from 9 a.m. to 4 p.m.
Ramona Museum of California History and San Gabriel Historical Society and Hayes House should be open for free from 11 a.m. to 4 p.m. as part of the Museum Saturday the first Saturday of the month. Both museums are about one block from the mission and offer free admission. San Gabriel Mission is located at 428 S. Mission Dr., San Gabriel, CA 91776, about two miles north of San Bernardino Freeway (I-10) (exit at Del Mar Avenue, travel north about one and a half miles to Mission Road, turn left and travel one-half mile to the mission parking lot for free parking or free parking on nearby streets or fiesta marked parking lots. More information is available from the mission rectory office at (626) 457-3035.